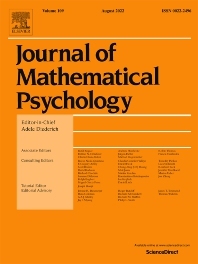 The Journal of Mathematical Psychology includes articles, monographs and reviews, notes and commentaries, and book reviews in all areas of mathematical psychology. Empirical and theoretical contributions are equally welcome. Areas of special interest include, but are not limited to, fundamental measurement and psychological process models, such as those based upon neural network or information processing concepts. A partial listing of substantive areas covered include sensation and perception, psychophysics, learning and memory, problem solving, judgment and decision-making, and motivation. The Journal of Mathematical Psychology is affiliated with the Society for Mathematical Psychology.